Global Warming  The Little Ice Age  Will there be another one? Is the Earth warming up or not? The Little Ice Age  Will there be another one? Of course the Earth is warming up a little, and has been doing so since long before the massive increase in industrialization that happened during the second half of the last century. The Earth warmed up before and cooled off again, many times. Evidence exists that shows that there were 17 or so Great Ice Ages. Lately the Earth has been warming up a little, ever since we began our climb out of the Little Ice Age during the 19th century. The cooling trend that marked the beginning of the Little Ice Age began around 1400, reached its peak during the 17th century and ended late in the 19th century. Although it could well be said that we are still coming out of it, that will most likely not be for much longer. Source: Figure 8: Solar activity vs. date as related to various phenomena. The reconstructed surface temperature record for the Sargasso Sea reflects in almost perfect synchronicity the variations in the solar radiation over time. Quoted in "Yes, The Ocean Has Warmed; No, Its Not Global Warming"
The time before the Little Ice Age was when the Viking settlements were thriving in Greenland, while the onset of the Little Ice Age caused those colonies to perish. The time of the Little Ice Age was a time of very low solar activity. Due to the lull in solar activity then there were consequently no or only low-intensity solar flares during that interval and also less solar radiation that hit the surface of the Earth. In addition, the reduction in solar radiation and in the intensity of the solar wind increased cosmic radiation that penetrated the atmosphere, caused vast increases in condensation kernels, thereby increasing the cloud cover. That caused the Earth to cool off. Now that we had a period of close to 100 years during which solar activity increased (Fig. 2), the Earth began to warm up a little even though annual mean temperatures are still a little below the average global temperature for the last 3,000 years. However, most likely the current warm spell won't last all that long. After all, if we go by the downward trend in global temperatures during the past 3,000 years, it is bound to get colder, much colder. Most likely the people are right who predict that within about 30 years we'll enter another Little Ice Age and that maybe in about 600 years, give or take about 300 years, we'll be at risk of entering another Great Ice Age, one of those that may last 90,000 years or so. The climate is constantly changing. Alternate cycles of long cold periods and much shorter interglacial warm periods occur with some regularity. 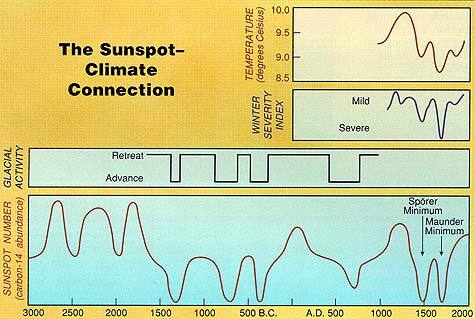 The typical length of climatic cycles in the last 2 million years was about 100,000 years, divided into 90,000 years for Ice Age periods and 10,000 years for the warm, interglacial ones. Within a given cycle, the difference in temperature between the cold and warm phases equals 3°C to 7°C. The present warm phase is probably drawing to an endthe average duration of such a phase has already been exceeded by 500 years. Transition periods between cold and warm climate phases are dramatically short: They last for only 50, 20, or even 1 to 2 years, and they appear with virtually no warning. Source: "THE ICE AGE IS COMING! Solar Cycles, Not CO2, Determine Climate"
By Zbigniew Jaworowski, M.D., Ph.D., D.Sc. The calculations done by General Circulation Models (GCMs) are the main source of the information that fuels the global warming hysteria. Nevertheless, not one of them comes acceptably close to accurately calculating what the climate presently is at any location, let alone of the whole Earth. Not only that, but all of the GCMs differ widely from one another as to what the climate was in the past, and as to what it is supposed to be in the future. Therein lies the problem. No one in his right mind will base any decisions about the future on tools that cannot determine with acceptable accuracy what the present is and the past was. Reality check: UAH (University of Alabama in Huntsville) monthly globally averaged lower atmospheric temperature variations since 1979 as measured by NOAA and NASA satellites. Next Page: Is the Earth warming up or not?